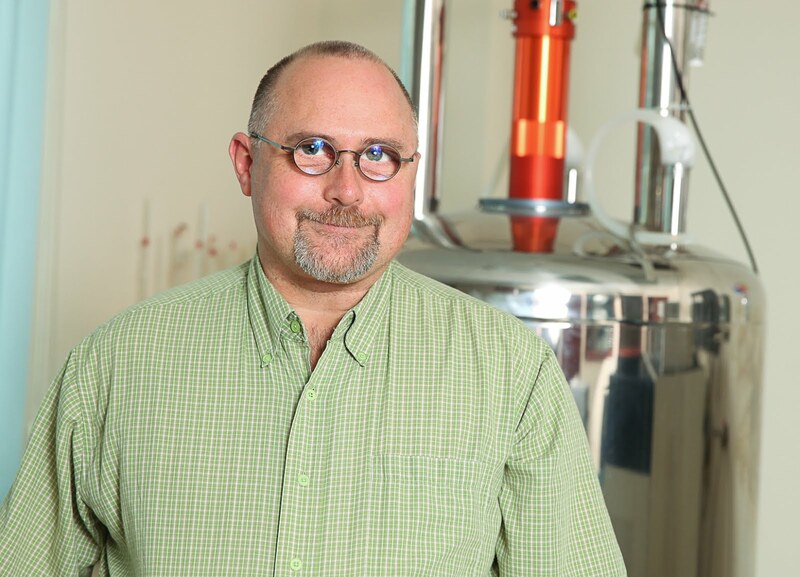 University of Ottawa NMR Facility Blog: Why Are Some of My HMQC Correlations Doubled? HMQC and HSQC signals are 1H detected with 13C decoupling. The sequences essentially throw away all of the signals for protons attached to 12C and retain all of those for protons attached to 13C. The coupling between 1H and 13C is used to establish a correlation but while the 1H signal is being detected, the 13C is decoupled. Occasionally you may find that some of your HMQC/HSQC correlations appear to be doubled or have a much lower than expected signal-to-noise ratio. Often this is due to poor 13C decoupling and is a problem for correlations at the extremes of the 13C chemical shift scale. At moderate magnetic field strengths, 13C "garp" decoupling is efficient over about 150 ppm or so. If the correlations are near the limits of the center of the 13C axis plus or minus (150 ppm/2), then you will find a loss in signal-to-noise ratio and perhaps some signal doubling due to partial 13C decoupling. 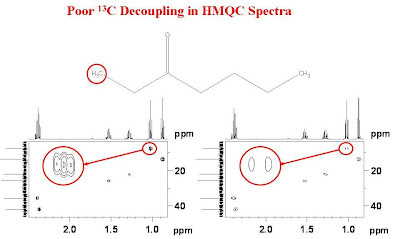 Below is an example of the partial HMQC spectrum of 3-heptanone. In the left panel the 13C offset was set near the 13C resonances. In the right-hand panel the 13C offset was set at 110 ppm and the terminal methyl signal is poorly decoupled. If you encounter this problem, center the 13C offset closer to the correlation which is poorly decoupled.